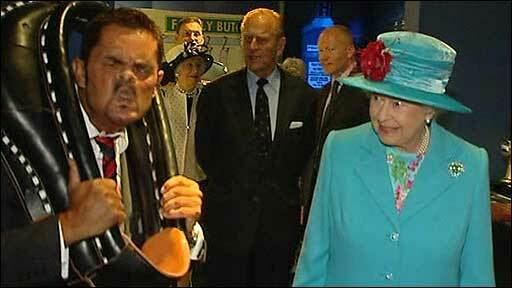 The Queen was greeted by a man who made faces at her as she met the world gurning champion on a visit to Cumbria. She was in Whitehaven to mark the town's 300th anniversary when she was treated to a special performance by Tommy Mattinson. Mr Mattinson, a master of the art of pulling faces while sticking his head through a horse collar, won the title at the Egremont crab apple fair. The Queen was also greeted by 10,000 people on her visit to Whitehaven. She arrived in the harbour town, along with Prince Phillip, by Royal Train on Thursday morning. They officially opened the refurbished Beacon museum and were special guests at a re-enactment of the freedom of the harbour granted to the US Navy in 1999. Gerard Richardson, of the Maritime Festival Committee, said: "It wasn't just the flag waving, it was the people wanting to reach out and touch hands, and the flowers. It was absolutely outstanding. "And to receive genuinely warm comments from Her Majesty about the area was really a bonus." Thursday marks 300 years since the Whitehaven Town and Harbour Act, which established a Board of Trustees to govern the area. The Liverpool-based tall ship Zebu has also arrived for the anniversary celebrations. After visiting the town, the Royal Couple headed for the Cumberland Pencil Company in Workington and lunch in Keswick before the final visit of the day to the Food Technology Centre in Penrith.